The passport was issued by the Passport Office, Singapore and 2 stamps for revenue purposes with BMA overprinted stamps for the value of $6 ($1 + $5). British Protected Person, Native of the Malay State of Pahang. It has a number of Consulate Registration in Subayara (Indonesia), Amsterdam (Netherlands) and New York (USA). Also, it has a number of travel to Netherlands East Indies, United States of Indonesia (Republik Indonesia Serikat), Indonesia, Ceylon, Pakistan, Netherlands, France, Israel and also from Singapore. Interestingly, it also has visa for the United States of America, the Netherlands, Netherlands East Indies and Israel. Malaya, Netherlands East Indies, Holland & United Kingdom. A fee of 2s was paid for the endorsement. Not valid for travel to countries for which a military or control commission or other permit is required unless such permit has first been obtained. Request and require in the name of His Majesty all those whom it may concern to allow Mr Aaron Joseph Judah to pass freely without let or hindrance, and to afford him every assistance and protection of which he may stand in need. For the second signature, it was probably signed by Sir Patrick McKerron, the Colonial Secretary (1946–1950) at the time. 1. British Passports are issued by the competent authorities throughout the British Empire and by British Diplomatic and Consular Officers abroad. Applications should be made in the authorised form obtainable from those authorities. 2. Passports are issued in Singapore at the Passport Office and at the Chinese Secretariat. Passports cannot be issued or renewed at the Passport Office for persons not at the time being in the Colony of Singapore. Passports should not be sent abroad by post. 3. The fee for a Passport is $6. 4. Passports are available for five years, in the first instance, unless otherwise stated. They may be renewed from time to time for further consecutive periods of one to five years from the date of expiry, provided the total period of validity of ten years from the original date of issue is not exceeded. The fee for each year of renewal is $1. 5. British Passports are not available beyond ten years from the original date of issue. Thereafter, or if at any time the Passport contains no further space for visas, a new Passport must be obtained. (a) A Passport including particulars of the holder's wife is not available for the wife's use when travelling alone. (b) Children who have reached the age of sixteen years require separate Passports. 6. The Passport is only available for travel to the countries name on page 4, but may be endorsed for additional countries (fee $1). The possession of a Passport so endorsed does not, however, exempt the holder from compliance with any immigration regulations in force in British or foreign countries or from the necessity of obtaining a visa where required. 7. Passports endorsed as valid for the British Empire are also available for travelling to territory under British protection or mandate, not, however, including Palestine, for which the Passport must be specially endorsed, or the Aden Protectorate, for which both an endorsement and a visa are required. It is most important that British Subjects resident abroad should at the earliest opportunity register the names and addresses at the nearest British Consulate. Failure to register may in a period of emergency result in difficulty or delay in according to British Subjects the assistance and protection to which they are entitled. Changes of address or departure from the country should also be notified to the Consulate. This Passport is a valuable document. It should not be altered in any way or allowed to pass into the possession of an unauthorised person. If lost or destroyed the fact and circumstances should be immediately reported to the Passport Office, Singapore, or the nearest British Consulate or British authority and to the local Police. New Passports can only be issued in such cases after exhaustive enquiries. State of Singapore, covers the period from 1946 until 1963. After the dissolution of the Straits Settlements in 1946, Singapore become a Crown Colony under the British Empire. It is essentially based from the quarter representing Singapore in the arms of the Straits Settlements. 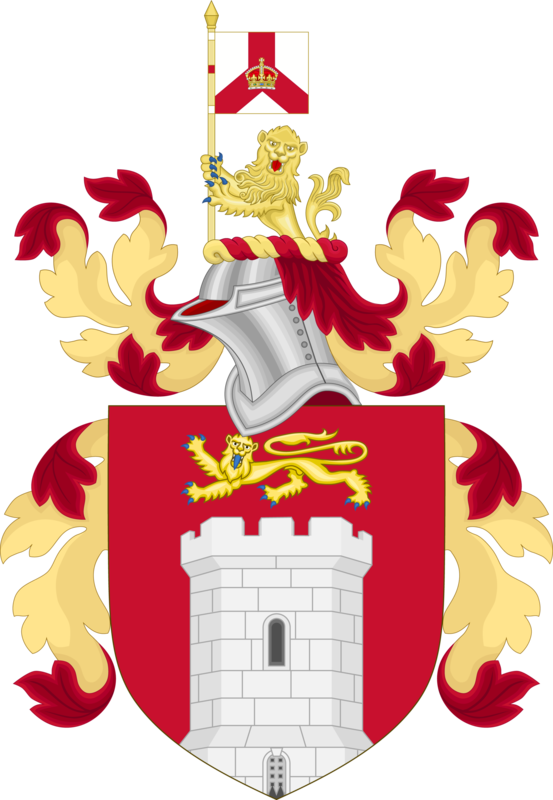 The arms of the colony was effectively retired when Singapore became a self-governing state in 1959 and in the spirit of Merdeka (Independence), the present coat of arms of Singapore was adapted instead. On 1 April 1946, the Straits Settlements was dissolved and Singapore together with Cocos-Keeling and Christmas Islands became a Crown Colony with a civil administration headed by a Governor and separated from peninsular Malaya where Penang and Malacca were merged with as Malayan Union. In July 1947, separate Executive and Legislative Councils were established and provisions were made to allow for the election of six members of the Legislative Council the next year. In July 1946, Labuan became part of the Crown Colony of North Borneo. From 1 January 1949 until 2 June 1959, it was within the UK and Colonies. During this period, the sovereignty of the Cocos (Keeling) Islands was transferred to Australia in 1955. The administration of Christmas Island was also transferred to Australia in 1957 at the request of the Australian government. Flag adopted on 3 December 1959, coat-of-arms adopted on 26 November 1959. From 1958–1965 Singapore morphed from British colony to self governing state to special autonomous state in the Federation of Malaya to an independent state. From 3 June 1959, Singapore was an independent Commonwealth country as it was given autonomy within the British Empire. 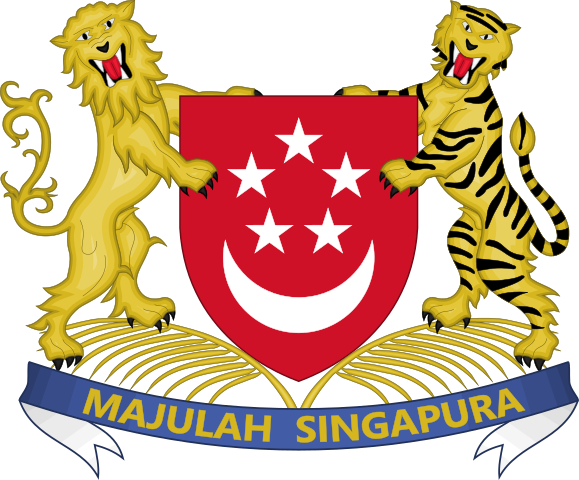 From 16 September 1963 until its expulsion on 9 August 1965, Singapore formed as a state within the Federation of Malaysia. The Merger Referendum passed in 1962 and led to Singapore joining the Federation of Malaya along with Malaya Sabah and Sarawak as a state with autonomous powers in September 1963. 9 July 1963 the leaders of Singapore, Malaya, Sabah and Sarawak signed the Malaysia Agreement to establish the Federation of Malaysia. With the conclusion of Malaysia Agreement all Singapore citizens became automatically Malaysian citizens without registration on 16 September 1963 upon Singapore's merger with the enlarged Federation of Malaya on that date which formed Malaysia. And upon Singapore’s secession from the Federation of Malaya on 6 August 1965 a new Constitution came into effect which granted special state-level, State of Singapore citizenship to all local residents in Singapore and to all pre-independence colonial British Subject Citizen of the United Kingdom and Colonies (BS-CUKC) passport holders who were British subject with CUKCs as of 16 September 1963 and these Singapore citizens were still considered British citizens at that time as / since exercising Singapore Citizenship Ordinance was first created in 1957 and became law on 21 October 1957 before the commencement of Singapore Constitution when Singapore was a within self governing colony of the United Kingdom. With the passage of the 1958 Constitution, Singapore attained the status of a self -governing state AND with a creation of a self- governing “State of Singapore’’, the British Government retained control over defence, foreign affairs and internal security through the presence of the Queen’s representative, the U.K. Commissioner and then all people became “Citizen of Singapore’’ by operation of law. Under the 1958 Constitution, the Head of State, swore allegiance to Queen Elizabeth II of the United Kingdom that is he acted as the Queen’s representative and as such did not possess any personal discretion and he also acted more as a proxy for the British Government. The 1958 Constitution was the last Constitution requiring any office bearer in Singapore to swear Oath of Allegiance to the British Crown. The Governors of Singapore ruled Singapore. The men that held this position governed the Crown Colony of Singapore from 1946 to 1959, on behalf of the Colonial Office until Singapore gained self-governance in 1959 in where the Office of the Governor was abolished. Sir Franklin Charles Gimson (Chinese: 詹遜, 10 September 1890 (Barrow-on-Soar, Leicestershire, England) – 13 February 1975) was a British colonial administrator, who served in Ceylon from 1914 to 1941, and later as Colonial Secretary of Hong Kong (28 August 1945 – 30 August 1945) and Governor and Commander-in-Chief of Singapore (1 April 1946 – 15 November 1952). Gimson was the first Governor of Singapore from 1946 to 1952 and reinstalled the civil administration in Singapore. He abolished the military government which had been set up by Lord Louis Mountbatten (as he then was) in 1945, and reinstalled the colonial civil administration. Entitlement to the status of British subject was first codified by the British Nationality and Status of Aliens Act 1914, which came into effect on 1 January 1915. Before 16 September 1963 Singapore was part of the United Kingdom and Colonies for nationality purposes. This means that a person born there, or descended from a person born there, could have become a citizen of the United Kingdom and Colonies. On 16 September 1963 (Malaysia Day), Singapore became a part of Malaysia, and was treated for nationality purposes as an independent Commonwealth country. At that point a person who was recognised as a citizen of Singapore was accepted as a citizen of Malaysia. At the same time citizenship of the United Kingdom and Colonies was lost by those who became citizens of Malaysia, apart from in certain cases where a person had a continuing connection with the United Kingdom or a remaining colony, protectorate or protected state. When Singapore joined to form Malaysia, it was given a unique privilege unlike Sabah or Sarawak to maintain a separate state-level citizenship. Use of overprinted BMA revenue stamps on page 1. Scheider, Gil. 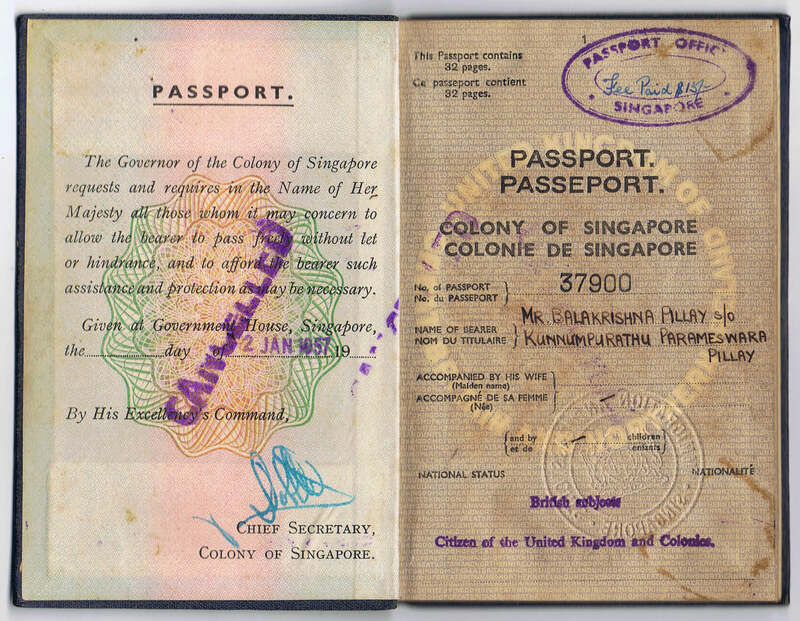 (2012 Oct) The Singapore Passport - A Short Presentation of Its History from Colonial Times to Independence.